Dec 8, 2013; Foxborough, MA, USA; Cleveland Browns head coach Rob Chudzinski throws up his arms after pass interference was called on cornerback Leon McFadden during the fourth quarter of their 27-26 loss to the New England Patriots at Gillette Stadium. BEREA, Ohio– Even a day later, most of Cleveland and Browns fans are still talking about the officiating at the end of the Browns loss to the Patriots Sunday. Even national talk show host Rush Limbaugh said he felt bad for Cleveland fans on his show Monday, mentioning how the pass interference on Leon McFadden was a “bad call” that ultimately cost the Browns the game. However, Browns coach Rob Chudzinski refused to blame the game on the officiating. The officials called pass interference on McFadden in the end zone when Tom Brady threw a pass over the head of Josh Boyce. The penalty gave the Patriots a first down on the Browns’ one for a gain of 29 yards. Chudzinski was asked after the game if he thought it was pass interference. Chudzinski was asked on Monday if he felt the same way after reviewing the replays. A few moments earlier, Jordan Poyer was called for unnecessary roughness when he tried to dislodge the ball from Julian Edelman on Edelman’s touchdown catch. Poyer hit Edelman with his shoulder –not his helmet– in the shoulder area as Edelman was making the grab. Chudzinski also didn’t agree with the call on Poyer. Chudzinski was asked if he thought the pass interference penalty should be a 10- or 15-yard penalty rather than a spot foul, like it is in the NFL. Many times a long pass into the end zone, teams are looking for a pass interference call. The 15-yard penalty was enforced on the ensuing onside kick, allowing the Patriots to start at the Browns’ 40, rather than around their own 45 with 1:01 to play. The two penalties accounted for 44 yards on the final drive. Besides the end-of-game penalties, Chudzinski had to challenge two calls in the game the officials made that ended up being reversed. The Browns had seven penalties for 75 yards called against them, but none were as costly as the two at the end of the game. The Patriots had six penalties for 41 yards. Still, the Browns had plenty of opportunities to win the game, including recovering an onside kick that would’ve won the game. Chudzinski defended the Browns “hands team” was in the proper alignment as the Patriots attempted the onside kick. Fozzy Whittaker touched the ball before it went 10 yards, allowing the Patriots to recover. Despite the loss, Chudzinski is optimistic in what he’s seen. “I see the light and was encouraged by our team as they continue to work and move forward,” Chudzinski said. “The outcomes (wins) will come as players continue to grow in the system and make that steady improvements. In his Monday morning press conference, Bill Belichick summed up his views on the game. — QB Jason Campbell had his best game of his career, in terms of passing yardage, coming after practicing just two days after being cleared from a concussion. Campbell was 29-of-44 for 391 yards with three touchdowns and no interceptions and a rating of 116.8. He also had two runs that picked up first downs for a total of 27 yards. — WR Josh Gordon had his fourth straight game of over 100 yards and now has the franchise record for receiving yards in a season with 1,400. He surpassed WR Braylon Edwards’ previous record of 1,289. Gordon has three games left and has only played in 11 games. Chudzinski was asked if Gordon is an elite NFL receiver. Gordon’s highlight against the Patriots was a short pass that he turned into an 80-yard touchdown. — TE Jordan Cameron had 9 receptions for 121 yards and a touchdown. Cameron had been quiet in recent weeks, but had a big game against New England. –RB Willis McGahee suffered a concussion and OL John Greco sprained his knee. Both players will be evaluated and updated Wednesday. 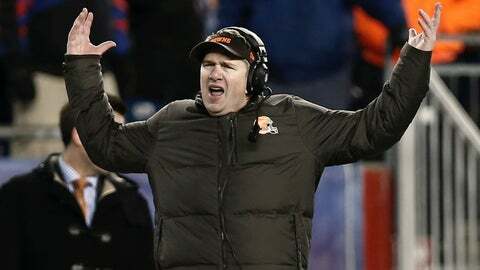 — Chudzinski defended his decision to go for the two-point conversion when the Browns were leading 12-0. — QB Caleb Hanie was Campbell’s backup Sunday and QB Alex Tanney was inactive. Hanie was the only Browns player who was active that did not play. — Chudzinski was asked about DB T.J. Ward’s tackle that likely ended the season of TE Rob Gronkowski. “He’s a big, tough guy trying to get him on the ground,” he said. “We feel terrible about that and hope he has a speedy recovery.